A three-person delegation from the Saudi Arabian Cultural Mission (SACM) visited with UHD officials last week to further goodwill and understanding between the university and the Mission. Present at the meeting were Wafi Albalawi, SACM Assistant Director of Academic Affairs for the Southern Region of the USA; Mahdi Obeid, SACM Academic Advisor; Taher Fenaish, SACM Advisor for ESL Students; Don Bates, Dean, College of Business; Pat Ensor, Executive Director of the Library; Laura Gonzalez, Coordinator of International Admissions; Robert Jarrett, Dean, College of Arts and Humanities; Gail Kellersberger, Director of the English Language Institute; Tranishia Parker, Associate Director of Graduate and International Admissions; Beth Pelz, Dean, College of Public Service; and Gary Stading, Assistant Vice President for Academic Affairs and Dean of Undergraduate Studies. Over 120 Saudi students attend UHD presently, many of them on full scholarship from SACM. "There is room for growth," Albalawi stated. He noted that Saudi students like the UHD environment and many want to continue their education here. SACM encourages students to stay at the university where they learn English and feel comfortable because the Mission sees this as a recipe for success. "First they must learn English well," Fenaish said. Most of the Saudi students are presently studying English at the English Language Institute. As they graduate from ELI, they will be enrolling in degree programs at UHD. 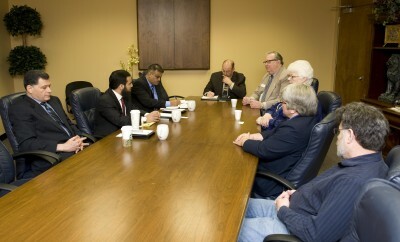 At the meeting, the delegation discussed some of its plans and needs and gathered information from UHD officials. SACM is doing all it can to support student progress and to create the policies and procedures that will best help these students adjust to a new culture, language and educational system.